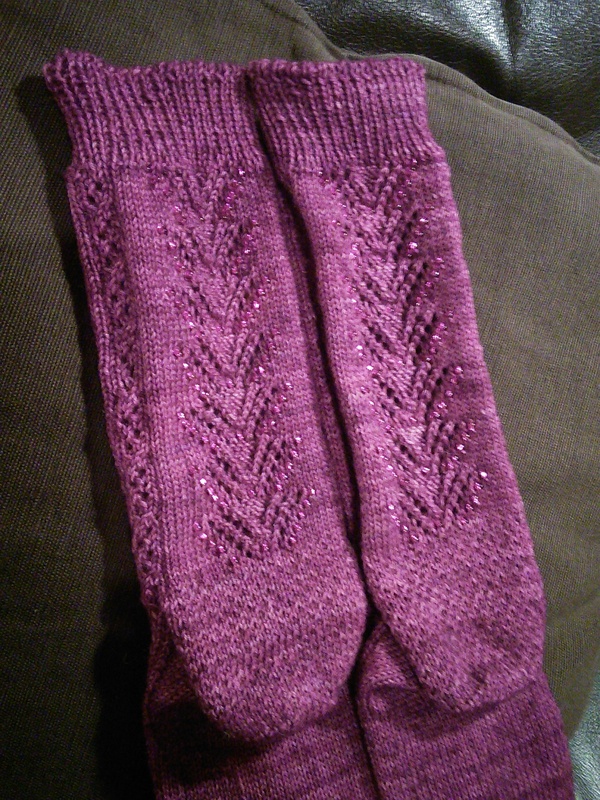 Looking back, I see that the last time I updated my knitting project progress was in March. There’s quite a lot to catch up on. 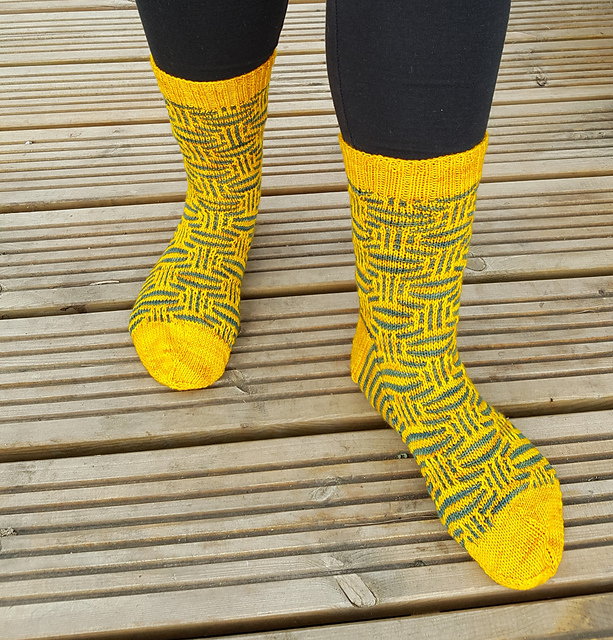 Legwarmers – April 4th, a commission from my sister to send to a mutual friend’s new baby. 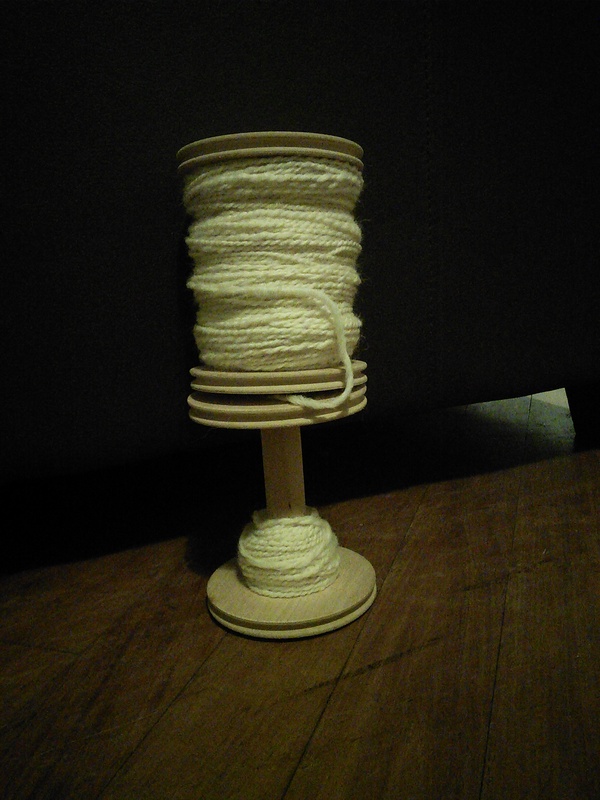 The late-night photo has not been kind to this yarn. It wasn’t nearly this orange in real life. Bobble hat from handspun – June 3rd. This uses up a braid of Hilltop Cloud fibre, plus my first attempt at navajo plying with some scraps of merino broken tops from John Arbon. I’ve also been doing a bit more handspun, even keeping up with Tour de Fleece for a couple of weeks until watching Tour de France and knitting socks for Tour de Sock kicked in. I spun some Masham fibre that I bought at the very first Yarndale. It was 200g of four different natural colours. I worsted-spun a 2-ply at (I think) about a heavy DK weight, maybe worsted weight of each colour and I have plans for this to become a cushion to match, or at least complement, the rug on the living room floor. With Tour de Sock moving 6 weeks later, it fell at a better time to fit in with work. This meant that I completed 4 stages within the set time: my best result ever. I’m still working on stage 5, which I never really found any flow with. It’s beads and cables, so needs proper concentration. Let’s not talk about stage 6, OK? Quite pleasingly, this brings my total of completed knitted/crocheted projects for the year to 12 (not counting handspun projects) , thus meeting my target for the whole of the year with over three months in hand. Tour de Sock stage 5, as I’ve already mentioned above. The brioche swatch has not grown any further and won’t do unless I remember what needles I borrowed from it. It just needs finishing up really and then I can cast on a proper brioche project. I’ve been swatching for a Woolly Wormhead hat from her new collection, Elemental. I’m even using the correct yarns as there was a handy 25% off sale. After doing two swatches, neither of which reached the correct gauge, I think I’m there with the third set of needles so the cast-on will happen when I can remember to gather up some cotton yarn (non-felting) to use for the provisional cast-on. 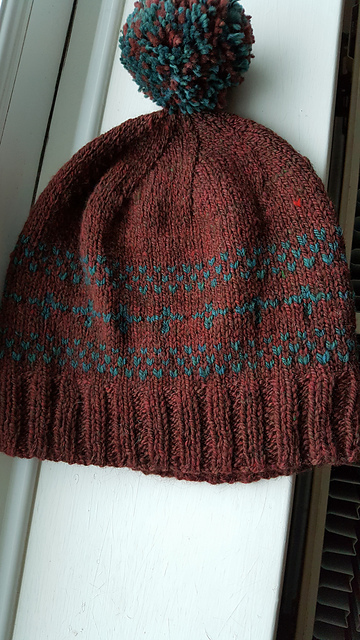 (NB since beginning to draft this post, I am now 75% of the way through this hat and loving the German short-rows). 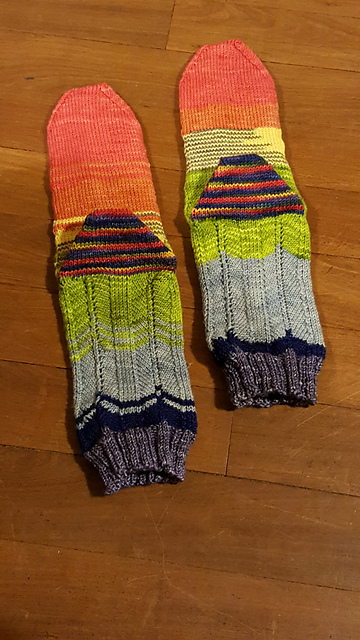 A pair of Cat Bordhi socks using some Socks that Rock mediumweight. 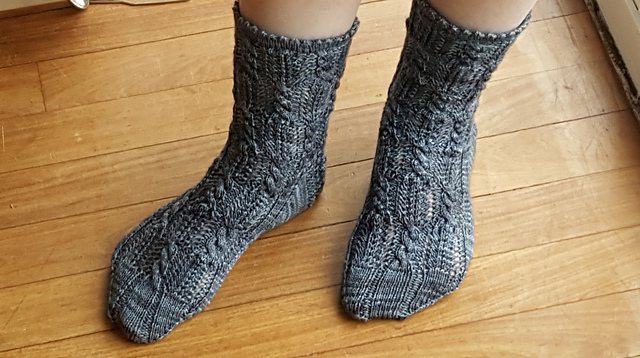 These were my carry-along sock project for a few weeks earlier in the summer before TDS took all my available knitting time. 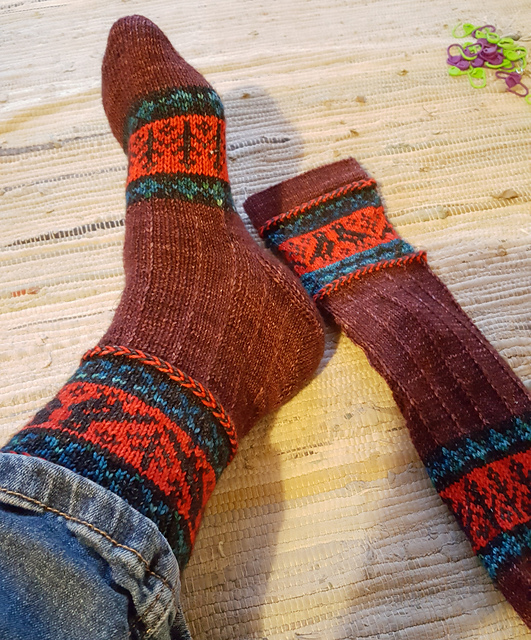 I’m just at the heel of the first sock, so waiting for the urge to knit these to strike again. 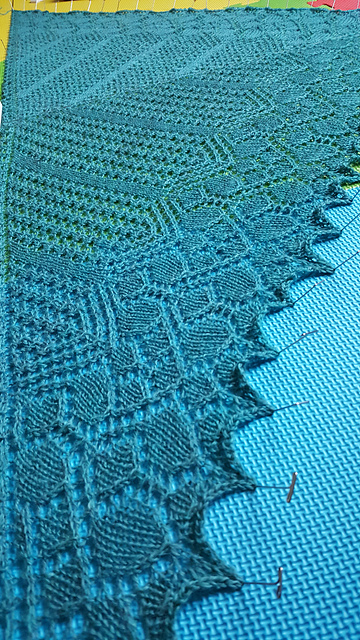 The yarn I recovered from the frogged Color Affection has been used to begin an intarsia shawl from Knitty. The colours are looking great, but I’m not convinced how far I’ll get with it. The other knitting WIPs are, of course, the plankton crochet scarf and the 2011 knit a block a month blanket. The intended recipient of the blanket will shortly be 6 years old. She is not particularly impressed by being told that a pile of knitted cotton squares in a box are for her. 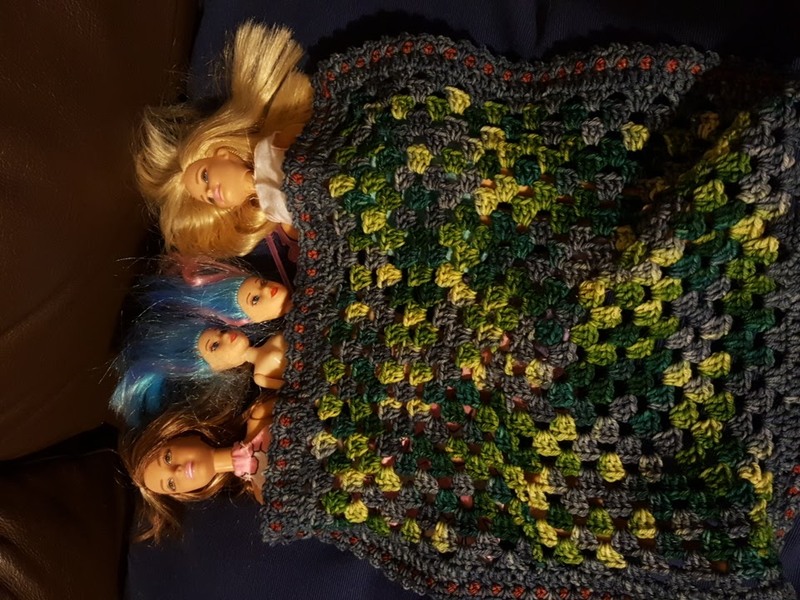 I do need to knit an awful lot more in order to make the blanket big enough. While deep in the middle of TDS, we took the kids on holiday away from screens for a week. My Mum very kindly sent some sewing supplies for them and they both got into sewing. The 9yo managed a pretty good counted cross-stitch piece, as well as some free-style minecraft weapons done mostly in running stitch on Binca canvas. The 5yo also managed some of both. I got very fed-up of constantly re-threading needles and untangling knots, but it was great to see them engrossed in something completely non-screen-based. All that stitching re-awoke my teenage habit of cross-stitching and I spent some time looking for the big cross-stitch project I got to take away with me to university. After consulting family members, I discovered that someone remembered seeing it at our last house, so that meant it was definitely somewhere here. They thought it had been with “all my knitting stuff”, but it definitely wasn’t now. After much searching, I found it in a box of musical instruments in my office cupboard (along with my ocarinas, which had also been mysteriously missing for a while). The project is a picture of the wizards from the Discworld Unseen University and is probably less than 20% completed. It turned out that I did make friends at university, so the anticipated long evenings of sewing alone in my room never materialised. I’ve spent a few evenings on it since finding it, so I hope to complete it someday. The other cross-stitch kit I have on the go was a present from DH about 2 weeks before I discovered knitting. That one is fiendish, with loads of half and quarter stitches, while the Discworld one is really relaxing as it’s all whole stitches. It is much more likely that the Discworld one will be finished one day. My aim for 2017 of keeping better records of spinning projects has not been met. See above for completed project. I’m now nearly all the way through a beautiful braid of fibre from Hilltop Cloud. 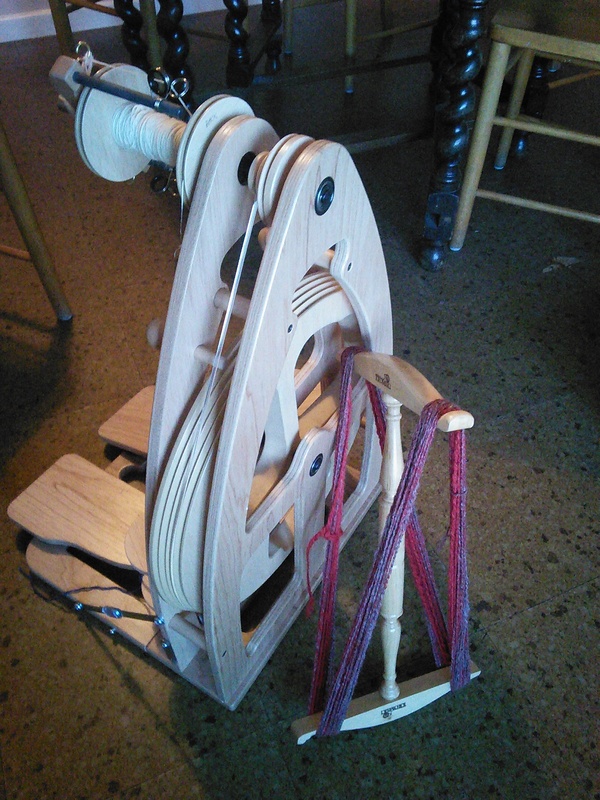 I’m spinning it fractally, so it should be a lovely marled/barber-pole skein when it is done. The Suffolk skein is washed and hanging out to dry. Tomorrow I’ll try and figure out how thick it is. Somewhere between DK and worsted I think. I’ve moved onto some Black Welsh Mountain. The fibre feels a lot harsher than the Suffolk. I’m spinning it quite thin, doing a lot of checking against the sample to try and keep it even. Harder than with a thicker yarn. Tour de Fleece Day 10? I am up to date with my commitment to spin at least 10 minutes for each day that the riders ride, although a couple of times it has carried over into the next day for a double stint when work and family commitments required. 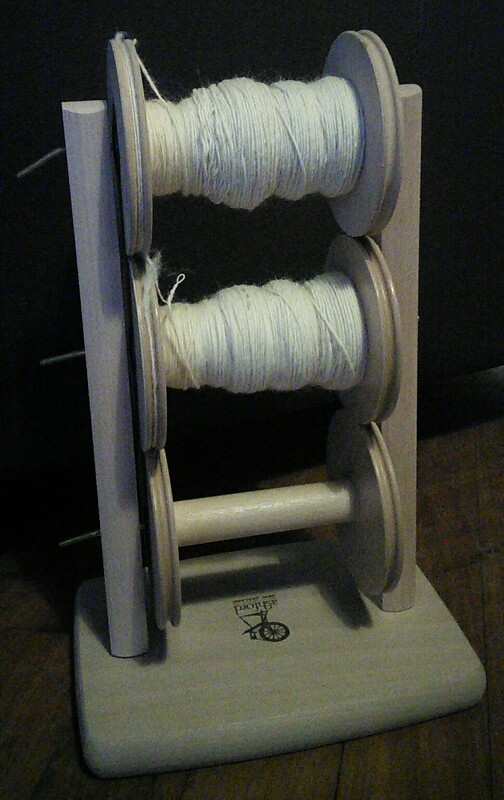 The top bobbin is a normal 2 ply. 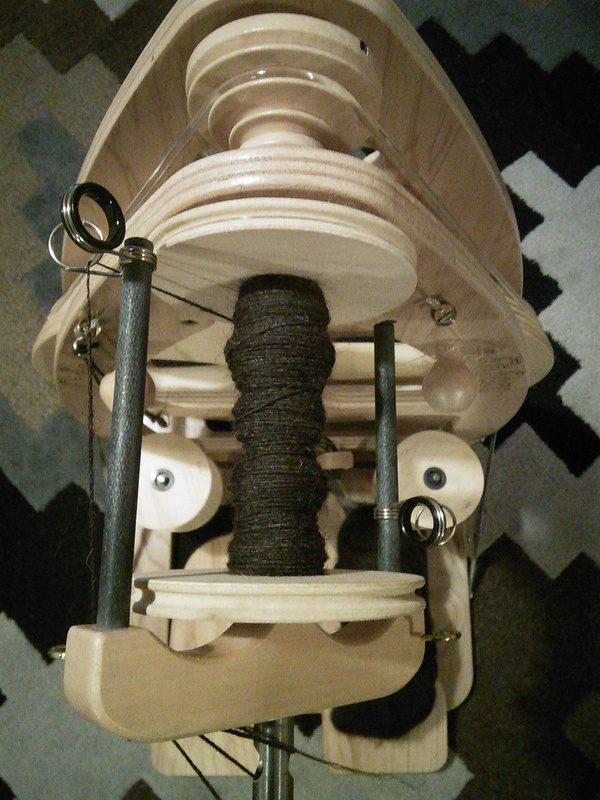 The bottom one is the leftover, Andean plied. Apologies for rubbish night time shots. 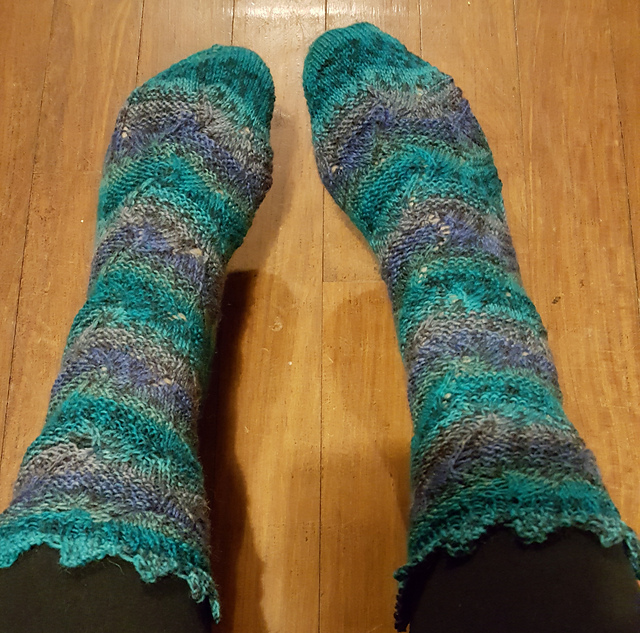 Did I mention I finished the socks as well? I’m discovering, with the help of my team mates in team Awesome Already, that the trick to completing projects is actually sitting down and working on them. Who knew? 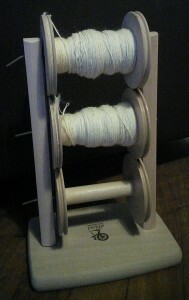 Day 3: more creamy white wool spun. If you want pictures, look at the day 2 post and imagine a bit more. The yarn I washed yesterday has come out really very nicely indeed. Despite making a complete guess of how much ply twist to put in, it’s very nearly balanced. It is a very interesting yarn in terms of thickness, being somewhat variable. Very much enjoying the bicycling on TV. Hurrah for Chris Froome! I read his autobiography last month: fascinating story. 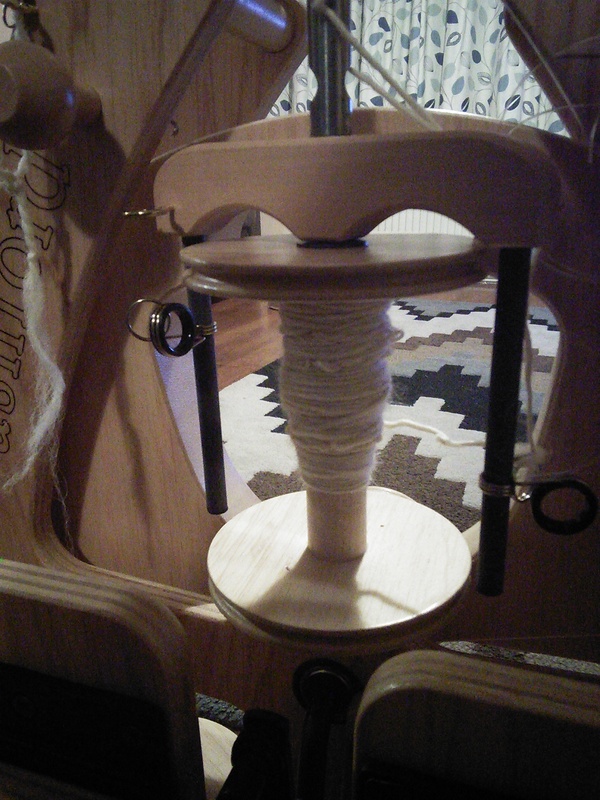 More spinning on the lovely creamy wool, which is from a Suffolk sheep. Plus I nidded and nodded some yarn which is a blend of Jacob and BFL, Navajo-plied a few weeks ago. 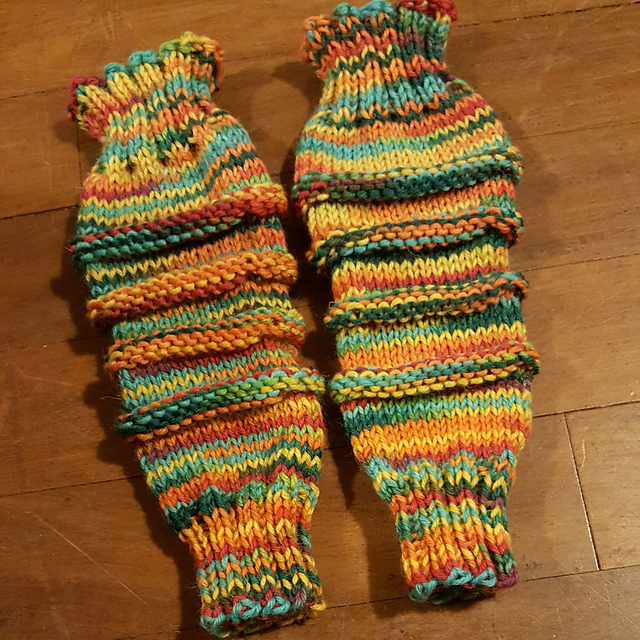 I had varying success making rolags in order to practice my long draw. I could do with a few more lessons.